Moonwalker Alan Bean. As a single document, Reaching for the Stars is one of the most fascinating and important records of the exploration of space you could possibly own. “Reaching for the Stars” was created for the rotunda of the U.S. Astronaut Hall of Fame as an inspirational mural. In his work of art, you can actually feel and see the vestiges of lunar exploration. 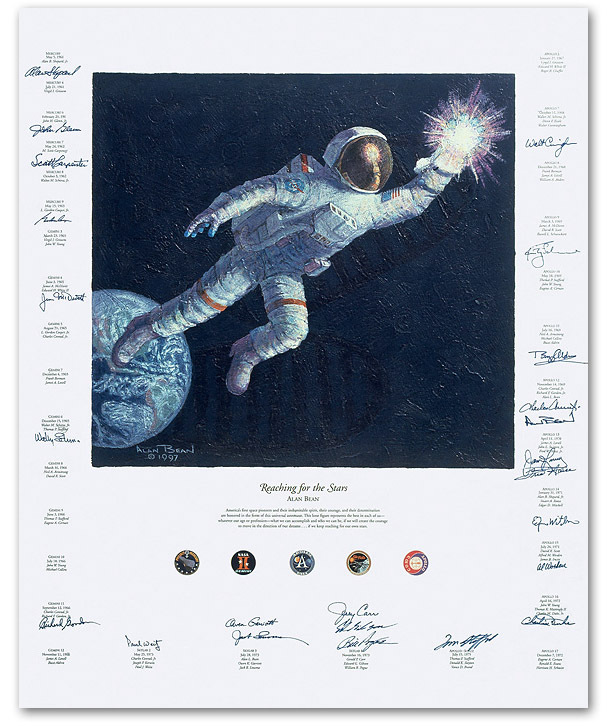 Just as with his original, your canvas features Alan Bean’s trademark ‘moonprints’ of authentic lunar boots, impressions from a core tube-bit used to collect lunar soil samples and marks from a hammer used to drive the staff of the American flag into the Moon’s surface. reproduction process compares in quality and value. The resulting fine art canvas is as close as you will come to owning the original work of art. Note: The canvas is supplied mounted on a stretcher frame as standard, but it is also available rolled. If you prefer this option please type 'Rolled' in the addittional comments section of our order form at checkout, or specify when calling us. Overseas Orders: Additional shipping charges apply to this item if shipped stretched, please call or email for quote. No additional charges apply if shipped rolled.